Coll. No. 1116, 28 May 2015, characters observed: Perennial, to 5-6 cm., with scapose inflorescence to 9 cm., spreading by leafy stoloniferous branches; Leaves, basal and cauline, entire, basal, linear-oblanceolate, 35 mm. × 2.5 mm., cauline, linear, 13 mm. × 1.5 mm. ; Inflorescence, single heads on scape to 8 cm. ; Receptacle epaleate; Phyllaries, 2+series, ±equal, 4 mm., hairy abaxially, ascending multicellular hairs with clear crosswalls, glandular between hairs; Flowers of 2 kinds; Pappus of bristles, 2 mm., + short scales, that of ray and disc flowers alike; Rays, #±80, corolla white, fading lilac, 8 mm. × 0.5 mm. ; Disc flowers, corolla yellow, lobes triangular; Achene, short hairy. Field Notes: Coll. No. 1116, 28 May 2015. 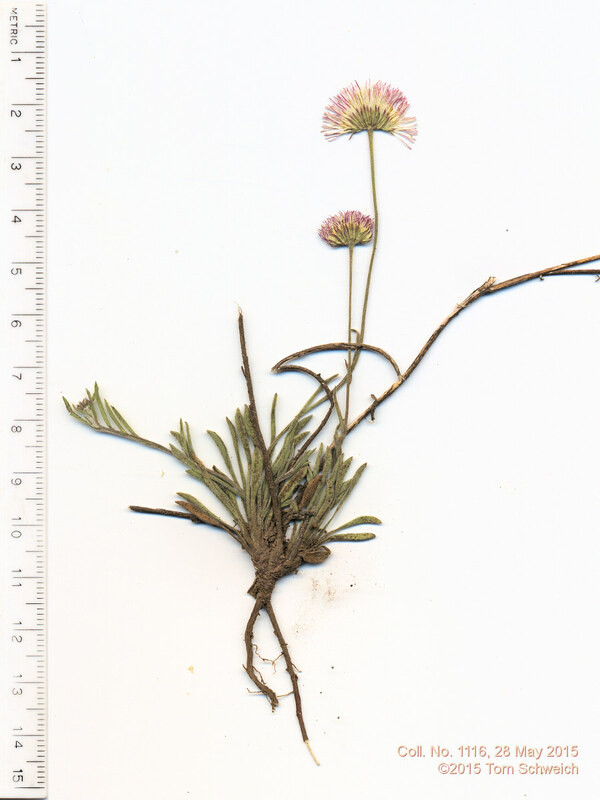 Other photos about Species - Asteraceae or Erigeron flagellaris.